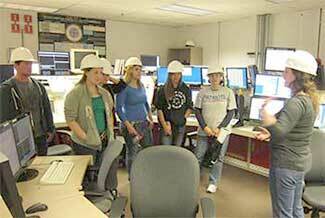 Visit Fermilab with your class or science club. For high school students, ages 14 and older: The number of people in a group should be no fewer than 10 and no more than 100. Groups must provide at least one adult chaperone (instructor or responsible adult) for every 10 students. We recommend that groups bring extra chaperones to ensure that the minimum number make the trip. Tours are not permitted for groups that arrive without the minimum number of required chaperones. Groups may arrange to eat lunch in the Fermilab cafeteria. There is no cost for student tours. You must make your request at least three weeks before the date of the tour using the tour request form. View the Fermilab complex from the 15th floor. Click here for resources to introduce your students to the science at Fermilab. Everything you need to know about Fermilab is a video about our work by Dr. Don Lincoln. Visit ecological areas at Fermilab. than the required number of chaperones.